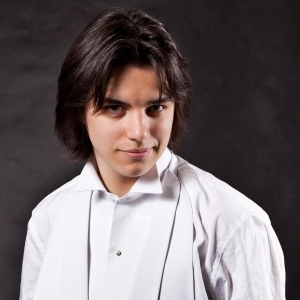 In year 2016 Dawid Runtz graduated from The Frederic Chopin University of Music in Warsaw in Symphony and Opera Conducting in the class of Antoni Wit. During that time he made his début with Warsaw Philharmonic. He studied with Jorma Panula and Jacek Kaspszyk during international masterclasses. The special point in his career was participating in Riccardo Muti Italian Opera Academy in Ravenna, guided by prominent and world class conductor Riccardo Muti. In 2016 Runtz won Second Prize at 6th Witold Lutosławski Conducting Competition in Bialystok. In 2013, he won Second Prize and Special Prize at 1st Adam Kopyciński's National Competition for Students of Conducting in Wroclaw. In 2014 he was invited to participate in the 1st International Forum of Young Conductors in Zielona Gora, individually representing Poland. Besides conducting achievements Runtz succeeded as a composer. In 2010 he won First Prize at Nationwide Competition for Young Composers Uczniowskie Forum Muzyki in Warsaw under the patronage of Polish Ministry of Culture and National Heritage, for the work Evolution for chamber orchestra. In followed year he won a prize at the International Young Composers Competition “Euritmia” in Italy for the work “Capriccio per flauto solo”. In 2015 he received a scholarship from the Ministry of Science and Higher Education Republic of Poland as well as scholarship of Marshal of Pomeranian Province. In 2008 – 2015 he received a scholarship from district governor of Wejherowo. For his education achievements in 2012-2016 he was beneficiary of a scholar of The Frederic Chopin’s University of Music Rector. He also received President’s of Wejherowo City Award twice for achievements in music. Since 2014/2015 season he has been collaborating with the Grand Theatre-National Opera in Warsaw as Assistant Conductor. Since 2017, due to scholar of Polish Ministry of Culture and National Heritage Republic of Poland, he has become an assistant conductor to Jacek Kaspszyk in Warsaw Philharmonic. In current year he participated in prestigious masterclass in conducting led by Daniele Gatti with The Royal Concertgebouw Orchestra in Amsterdam. In July he made his conducting début in Japan at the Pacific Music Festival in Sapporo, upon invitation from Director of the Festival, Valery Giergiev. In August Runtz led Polish Chamber Philharmonic in the Gala Concert of the 4th Krzysztof Penderecki Composing Competition as a part of International Sopot Classic Festival.